Maine set precedence this year as the first state in the nation to permit municipalities the authorization to regulate local food systems. LD 725 (Legislative Drawer 725), titled An Act to Recognize Local Control Regarding Food Systems (commonly known as The Food Sovereignty Act), grants municipalities control of their food systems, allowing producers to sell their products directly to consumers in any municipality that passes an ordinance. The implications for this bill are extensive and a huge leap forward for Maine’s local food economy. Producers can now control the processing and distribution of their products, and consumers can obtain products of their choice. The bill received strong support in the Maine Legislature and was signed into law by Governor Paul LePage of Maine on June 16, 2017. However, in a sequence of developments, The Food Sovereignty Act has faced several setbacks. 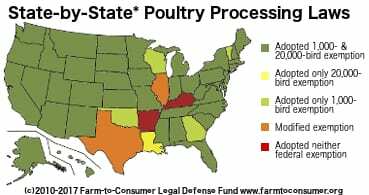 The USDA (United States Department of Agriculture) Food Safety and Inspection Service (FSIS) first challenged the law declaring that the language does not specify whether the ordinance meets state inspection programs for meat and poultry. In a July 6th letter to the Maine Agriculture Commissioner, FSIS cited concerns that the law would violate federal food safety regulations. Furthermore, FSIS is uncertain if it would meet the requirements set out in the Federal Meat Inspection Act, including meeting the federal requirement that meat inspection operations must be “at least equal to” that of federal inspection. FSIS asked for further information on how The Food Sovereignty Act will affect Maine’s meat inspection program and their “at least equal to” status. In response to the USDA criticism of the law, Governor LePage called for an emergency legislative session. In an August 29th notice to the Legislature, LePage proposed an immediate amendment to the law exempting meat and poultry and allowing for the state to continue to regulate those facilities. 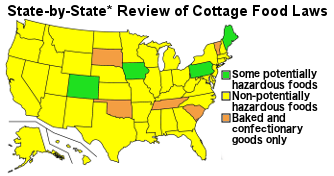 LePage writes, “at risk are five state-licensed facilities, thirty custom facilities, fifty-one small poultry processing facilities and 2,714 small retail processing facilities” that will transfer state regulation to federal inspection if the law is not amended. LePage, an advocate of Maine’s local food economy, is concerned that new regulations from Washington will have negative consequences for Maine’s growing rural economy, small farms, and local food industry. In the final developments of Maine’s Food Sovereignty Law, another emergency legislative session was held in late October. 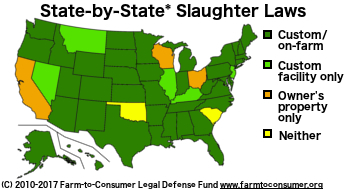 This session resulted in amendments to the law that require municipalities that adopt ordinances under The Food Sovereignty Act to “comply with state and federal laws when developing local ordinances for meat and poultry production and sales.” Essentially, this amendment hands jurisdiction back to state and federal authorities, but requires the state to recognize local authority to pass laws governing the direct exchange of food. 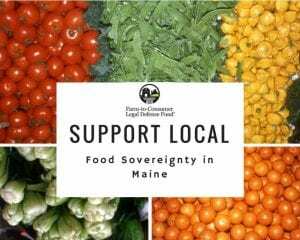 The Food Sovereignty Act is a progressive step forward in supporting Maine’s local food economy, increasing local commerce, and decreasing the reliance on importing food into the state. The Act has now been signed into law, for the second time, and food sovereignty has finally been recognized in Maine! We applaud the proponents of The Food Sovereignty Act for supporting this measure and tirelessly working to protect Maine’s local food economy in the wake of fierce opposition from federal authorities.